We sit at the end of a pier in San Francisco. The old wooden bench that holds us is splintered due to a combination of salty water and time. This mocha is so delicious that I need to close my eyes for a moment to take in el sabor. I close my eyes to take this moment in. This is my first time but he has been here before. He has sat in this same place. Drank this same coffee from his favorite café- Blue Bottle Coffee. He has spent time laughing here with his co-workers over their lunch breaks. I can see it now. A good cup of joe, a giant grin and a beautiful laugh. This place is special to him and he wants to share it with me. 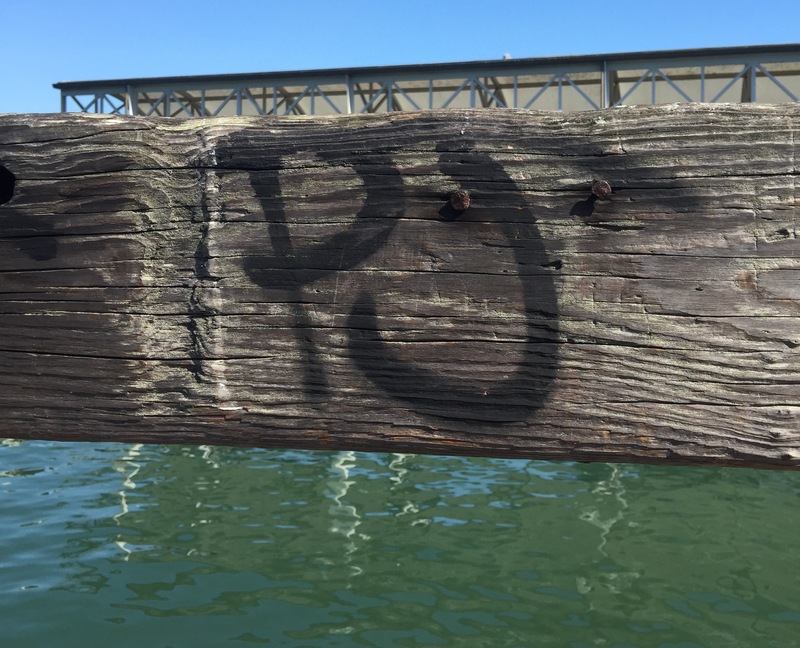 Spray painted onto the old wooden railing are the letters PJ. The letters delicately touch. They are painted with an artistic easiness about them, careful not to touch the rusty nails that lay on both sides of the J. Everything about this moment feels special. The weather. Sweater weather, a slight breeze with the smell of salt filling the air. The ambiance. Sitting on the dock of the Bay. The conversation. Sobre nuestras amor y esperanzas. La futura. The feeling. Butterflies fill my tummy- who knew that was possible after so many years. The person. You. This has to be one of my favorite moments. One of our lasts as a you and me. Do you ever wish that you could go back to a time before things changed? Before heartbreak, before confusion, before you realized that you wanted different things. This moment sometimes makes me feel that way. Then I reframe. That moment was a gift. Thank you for this gift and the many others that we gave to one another. Thank you for the most precious gift. Respect. You respected my decision. Even when you didn’t understand why. You understood that this is what I needed. Even if I didn’t fully understand why. You radically loved me by respecting this butterflies need to explore a different unmarked path. It’s really amazing how things can change so quickly. How I could change so quickly. How in a single moment you can recognize that though moments like this felt magical you knew that you wanted different things. And that’s ok. This was an empowering and affirming post for me. I love and respect the both of you.